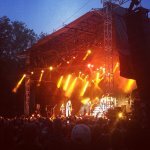 Def Leppard played a show at Sofiero Castle in Helsingborg, Sweden last night and setlist details are available. The band played only 14 songs after a delayed flight meant they didn't start the show until much later than expected. Only 7 songs were played from the 'Hysteria' album but they did manage to squeeze in a second encore of fan favourite 'Wasted'. The order of some songs like 'Love Bites' and 'Rocket' were swapped around from their usual places in this shorter show. The next show takes place tonight in Uppsala, Sweden. Played for the first time in Sweden. Last played in Sweden on 9th June 2006 in Solvesborg at Sweden Rock.